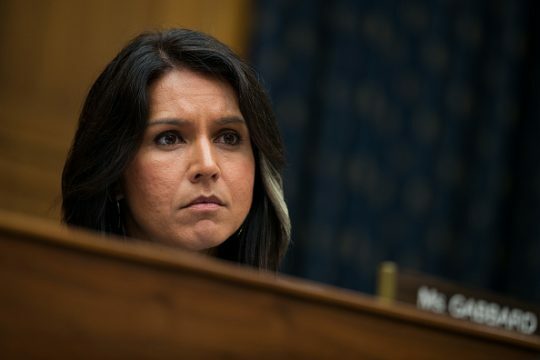 Rep. Tulsi Gabbard's (D., Hawaii) office has had one of the highest turnover rates in Congress since entering the House of Representatives in 2013. Legistorm's study of congressional staffing from 2001 to 2017 found Gabbard's turnover score ranked 16th among all current members of Congress, according to the Honolulu Civil Beat. Her turnover rate almost doubled that of Hawaii's other representatives and its senators. 2018 appears to have been a better year for Gabbard maintaining employees; it's the first year her turnover rate was below the House average. "Some members of Congress get a reputation for being hard to work for, whether due to anger management, shady ethics, poor pay, demanding too much or creating a toxic work environment," Legistorm says. "Whatever the reason, the resulting office dysfunction can lead to high turnover, helping to make a member of Congress more ineffectual. One possible side-effect of high turnover is making an office less responsive to constituents while being more dependent on lobbyists for advice," Legistorm continues. Other possible reasons for high turnover include shifts in congressional priorities or staffers moving to the White House. The Civil Beat notes that Gabbard's turnover has not been limited to "low-level staff and interns." Turnover has been especially high among her communications staff. Earlier this week, Politico reported Gabbard's campaign is in "disarray," with her campaign manager and consulting firm Revolution Messaging set to depart after the official launch, scheduled for Saturday. Several people familiar with the campaign described Gabbard as "both indecisive and impulsive." They told Politico she had staffers work through Thanksgiving weekend to prepare for launching the campaign before ultimately deciding to wait, and that pattern repeated itself in the following weeks. Her team was "blindsided" by her announcement of a presidential run on CNN's "The Van Jones Show" earlier this month. This entry was posted in Politics and tagged 2020 Election, Hawaii, Tulsi Gabbard. Bookmark the permalink.